New opportunity equals bigger scores right? It’s not always a proven formula but Calvin has crunched the numbers on the new Tiger. The former Swan couldn’t get a look in at Sydney. For two years now he has been battling the likes of Tippett and Pyke (who happens to have a rugby background) and then just when he thought the door was opening, Sam Naismith takes the #1 position. In total, he managed just 11 games. At Richmond though, he has so much more opportunity and things are looking much better. Firstly, who is his competition? Maric turns 30 this year and has been struggling himself with only 3 games last year and Hampson is a spud. Griffiths (13 games) pinch hits in the ruck, and Vickey has left. That leaves Nankervis as their #1 ruck. Surely it does! Doesn’t it? Why would they recruit him? If they wanted to run with one of the guys as their #1. It just makes sense to me, that Toby will be the man. Yep, even though he averaged just 69, he receives a 12% discount off that as he only managed to scratch together 6 games. This prices him at a touch over 60. I believe there is 15-20 points growth there which makes him a great R2. OH YEAH! You all know how much I rate the NEAFL competition and these numbers from Nankervis certainly support my case, but at the same time, proves that he is capable of scoring well… even if the statisticians up there inflate the stats each week. So there you have it. Toby did average triple figures but the thing that I think Richmond will like is his ability to go forward and snag a few goals. I think he’ll be there #1 ruckman, working alongside Hampson and occasionally drifting forward. Richmond fans who know more than me, please comment below with your thoughts. He couldn’t get a game ahead of Pyke and Naismith and they’re not what you would class as ‘A Grade’ ruckman. He’s going to need a truckload of hitouts to support his score, and maybe even a goal or six. In his games this year he only averaged 9 possessions. He’ll struggle to find the ball going against quality opponents who may just carve him a new one for monster scores themselves. He’s very inexperienced with just 11 games under his belt and he’s still a kid. He’ll play the season at the age of 22. He’s up against men and should cop a hiding. JACK– Risk it to get the biscuit. 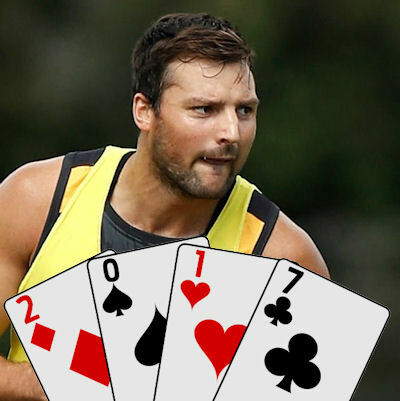 Nankervis, if he holds down a position in the team will improve on the 60 he’s priced at. No one can dispute that. By how much is the million dollar question. When he played last year from his 6 games, he posted two solid scores of 76 and 86. This is where I think he could be and if he is… then lock him in at R2, as a player who will grow 15-25 points, make you some great coin before you move him on during the bye period to someone like Stef Martin or Max Gawn who has the bye before him. What can Nankervis improve his average of 60 by? Will be No.1 ruck, just wont have the scoring potential to be worth 365k of your time and cash. Pass. Will be No.1 ruck, just wont have the scoring potential to be worth 365k of your time and cash. Pass for me. Not true. If you look at his stats from his U18 year, not sure if you can still find them, you’ll see that he actually has massive scoring potential. Posts decent hitout numbers, but can find the ball in the same vein as Stef Martin. His scoring should be seen as his greatest upside. When he was first drafted his scoring was huge and if I remember right recorded 200 at least once. Ruckmen take a while to develop and he has now had a few years in a good system at Sydney and could be ready to replicate those numbers in the big league?